If like me you are now itching to get something new into your wardrobe, persuading yourself that Spring is just round the corner and you can start to think about colour, then I suggest your first buy be a dress. As someone who is more likely to be found in trousers on a day to day basis this might seem a strange suggestion. It’s not that I don’t like skirts and dresses, actually I do, and in the summer with bare legs I wear them much more. But having found a couple of dresses which I can dress down with boots and wool or opaque tights, or dress up with my faithful black LK Bennett kitten heels, I realise how simple it is to dress in a dress! No need to search for the right separates to make up the outfit a dress gets you out of the door fast and looking pulled together. 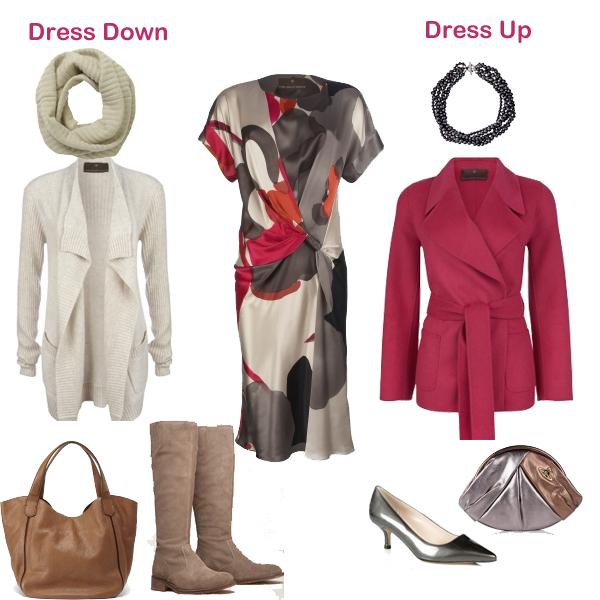 Here are a few double duty dresses that you can wear smart or more casually and some suggestions of how to wear. After all having a wardrobe that works for all occasions is the savvy and chic woman’s secret.